Plastics News is providing show daily newspapers at Plastimagen 2016. This project marks two firsts for Plastics News : the first time we’ve done show dailies in a language other than English, and our first time for show dailies in Mexico, although of course we will have stories both in print and online in English from Plastimagen. But show dailies are nothing new for Plastics News. We’ve been producing show dailies at trade shows around the world for 25 years. Our first dailies were at the NPE 1991 trade show in Chicago, and we’ve been doing dailies at every NPE since then. 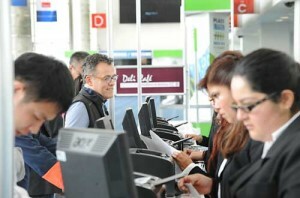 We’ve done smaller dailies at Plastics USA and Plastics Fair events in the United States. In 2013, we first went international, with English-language dailies at the K trade fair in Düsseldorf, Germany. We worked with sister publications PRW and Plastics News Europe on the K newspapers, as well as daily issues at the 2014 and 2015 Fakuma trade shows in Germany. Over the years, we’ve won many awards for our show dailies, from journalism trade groups like the American Society of Business Publication Editors (ASBPE). And this year I’m proud to bring our high-quality work to the Plastimagen audience for the first time. Covering Plastimagen isn’t new to our editorial team. 2016 marks the 20th edition of the Plastimagen trade show, and we’ve been sending reporting teams to the show for nearly all of those shows — every one since we started publishing in 1989. This year we have a larger team than ever. I’m at Plastimagen again this year, and most of our reporters have been to the show before, too. This year the team includes Steve Toloken, our news editor — international; senior reporters Bill Bregar and Frank Esposito; staff reporter Kerri Jansen; plus Stephen Downer, our long-time Mexico-based correspondent. We also have Michael A. Marcotte, a freelance photographer who has worked on many of our show dailies and events. The dailies are being put together by our team in Detroit, including art director Jessica Jordan, news editor Rhoda Miel and assistant managing editor Jeremy Carroll, plus the local production staff at Crain Communications Inc., our parent company. The crew in Detroit sends the pages electronically to a printer in Mexico City, which publishes the newspapers and delivers them to Plastimagen show attendees. We’re using three translators on the project: Liliana Herbstreith, Tamara San Roman, and Cecilia Hijar. I’m proud to offer Plastimagen show attendees our daily newspapers, and I look forward to getting feedback from readers this week at the Centro Banamex. You can find Plastics News at Booth 24, in the mezzanine area. Resin or polymer? What’s the more popular term today for plastic packaging?